Tickets £8 on the door; Shoreham Knitting & Needlecraft, 19 East Street; or ring 01444 482183. The concert is at St Mary de Haura, Shoreham on Saturday, April 6 at 7pm. 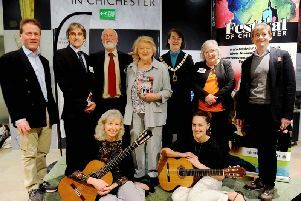 Spokesman Richard Howells said: “The concert, entitled Over the Rainbow, features two groups of singers from Steyning, Vocal Fusion Acapella and Kaleidoscope, both under the musical direction of Zoe Peate.